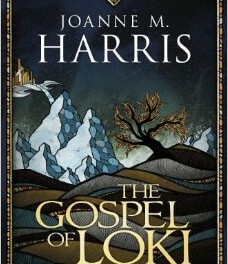 My familiarity and love of Norse Mythology was formed at a very early age through reading The Norse Myths (a retelling by Kevin-Crossley Holland — a fine volume, still available under the Penguin imprint), so I approached this with more than a glint in my eye, eager to see if Ms Harris could bring anything new to the table by retelling many of these from the point of view of Loki, the so-called Trickster God. Anybody who is vaguely familiar with the Norse myths as originally laid down by Snorri Sturluson in his Prose Edda (aka Younger Edda), will have heard of Odin, Thor, Heimdall, and various other characters and aspects of Viking mythology, including Hel, Yggdrasill, and Ragnarok itself: the ‘final’ battle at the end of the world between the gods of Asgard and the giants of Jotunheim. So it may come as a surprise to you that this book is rather cunningly told entirely in the first person, from a mythological voice that is at best unreliable (and dead!) and at worse, full of pure invective. 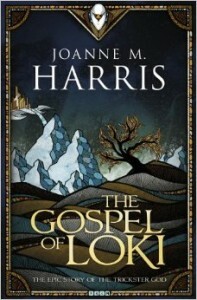 As could probably be expected, Loki comes across as a devilishly sneaky, self-serving obsessive — bursting with misdirected indignation, hate-fuelled jealousy and a whole lot of anger at his fellow gods, especially Odin the Allfather and the mighty Thor, although I daresay (rather fittingly) that it’s Heimdall for whom Loki’s hatred seems to run deepest. What also comes through however —indeed, it flies off every page— is the brilliant humour and infectious manner with which the author brings the reader slowly onto Loki’s side. Yes, we know he’s a scoundrel and a sneak, and we also know he was the cause of so much grief and tragedy for all the gods — we are after all, reading about his mischief throughout — but we also see some good in him and grow to care, just like we do all the best and most lovable of rogues. I do believe this is what Ms Harris was trying to do with her troublesome protagonist, and there are some very telling scenes between Loki and Thor in which we come to think of the pair as ‘good brother, bad brother’ (but still at heart, brothers), but we really needn’t have worried because she is a true storyteller, and many of these fine Norse tales have been retold here with both energy and chutzpah, albeit filled with a healthy sense of cynicism too. So has this succeeded in surprising me? Definitely, and although IMHO this was always designed as a commercial bestseller given the eminent popularity of the Marvel movie/comic franchise (Thor, Avengers, etc), it is also an excellent, winsome book, with a knowing air of smugness from that beloved rogue, Loki. Recommended reading.